Hairstylist Daniel McLennan’s is back in the state where his dreams were born. As a young boy growing up in a small Queensland mining town, Daniel McLennan’s childhood was spent a world away from the fashion capitals of New York and London. There wasn’t a single male hairdresser in Moranbah, but that didn’t stop him from pursuing his dream. He originally wanted to be a plastic surgeon, but was turned off by the idea of cutting people open. Instead, he cut his mother’s and stepfather’s hair, cut and coloured his grandmother’s hair, and tried out wild styles on three willing sisters and a brother. Not to be deterred, he continued doing what he loved and took any class at school he thought might help him pursue a career as a hairstylist. His talent quickly emerged and after winning his first hairdressing award, he set off for the big smoke at the age of 16, arriving in Brisbane with big dreams and bad fashion sense. It’s hard to reconcile that image with the charismatic man he is today, tall and confident, with the sophisticated air of someone who has reached the upper echelons of his industry, which he did at an early age. 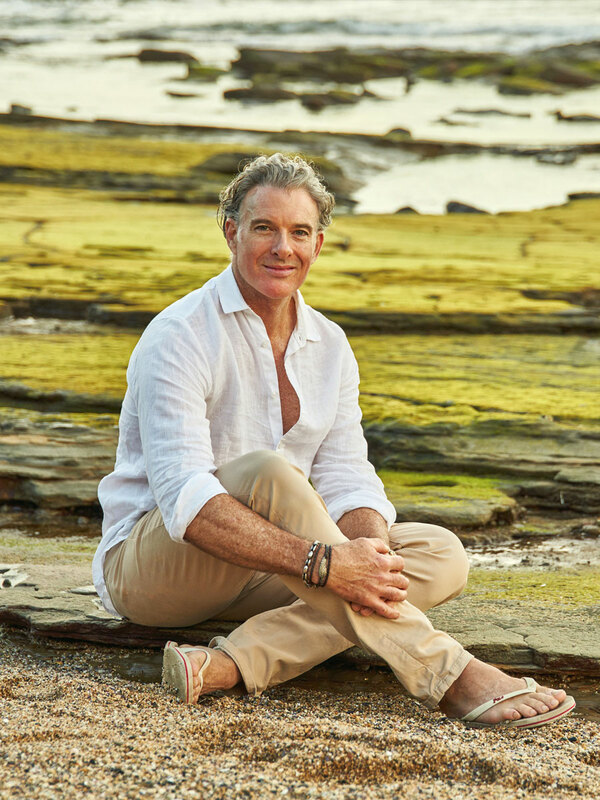 Having found his feet in Brisbane working for Sloans and Stefan, he opened his first salon in Noosa in the ’80s, before making the leap to London, where a glamorous world of stage lights and celebrities awaited him. He was only 22 and knew no one, but he quickly found employment at the Albery Theatre in Leicester Square, where he worked on stage productions and ran his own salon for six years. “I used to go to all the shows in the West End and would dress the wigs out and set the wigs and do the show, which was amazing. What I loved about that was I was doing period pieces and really different hair styling, which was fantastic. Celebrity styling was all in a day’s work, and he reels off a string of famous heads he’s worked his magic on including Kylie Minogue, Catherine Zeta-Jones, Dame Judi Dench, Helena Christensen, Maggie Smith, Petula Clark and Joan Collins. He opened two salons – one in Darlinghust and one in Surry Hills – before opening One Room in the beachside suburb of Bronte seven years ago. He won numerous awards and built a reputation in the entertainment and fashion industries, being called upon for Australian Fashion Week and New York Fashion Week. He styled photo shoots for Marie Claire, Who, TV Week, Oyster, Sky, Cream and Today. But the pull of being near family once again drew him to a new life. With his mother, sisters and three beloved nephews now all based in Caloundra, he moved to Kings Beach, where he lives with his American husband Damon in a unit within eyeshot of his mother’s and sisters’ homes. He purchased a Maleny salon, renaming it One Room, and runs it along the same sustainable principles he follows in his Sydney salon, which he continues to work in four days a fortnight, alternating between Sydney and Maleny. As a member of Sustainable Salons, he pays a weekly fee to ensure his salons are as close to zero waste as possible. Shampoos, colours and perming solutions are scraped into a bucket rather than the chemicals being washed down the sink. The company takes it all away, extracts the water and turns it into grey water. All the hair from the floor is collected in bags and made into hair booms to clean up oil spills. The plastics are sent to Melbourne and made into NBN cabling and park furniture, and all the metals from foiling are recycled. All proceeds from repurposing the salon materials are donated to OzHarvest to distribute meals to those in need – amounting to more than 2000 meals a month from the proceeds of hair salon waste alone. If hairstyling is Daniel’s number one passion in life, sustainability is his second. It’s something his eco-minded mother instilled in him from an early age, and the two clearly have a close bond and shared values. “Mum is a Buddhist-type, yogi-type person and she’s been a great role model for me. She’s big at picking up rubbish. We go walking together every morning and we collect rubbish from the beach. Asked what the pinnacle of his career has been so far, Daniel says he doesn’t feel he’s reached it yet.